There are more options than ever for people hoping to eat more sustainably. While we await clean meat, the Culinary Institute of America recommends meat reduction strategies, such as blending mushrooms with ground beef for burgers. Photo credit: Unsplash. Last week, at the Cultured Meat Symposium in San Francisco, the topic at hand was a product that might someday replace factory farmed meat. Known as cell-based meat, cultured meat, or clean meat—the label is still evolving—this product is biologically identical to farmed meat but grown in a lab from animal cells. Though it remains an estimated three years from market, clean meat has the potential for tremendous impact on our climate future if it can achieve quality and price parity with farmed meat. The buzz and excitement around clean meat has been growing ever since a team of Dutch scientists produced a $330,000 lab-grown hamburger in 2013, and this conference was no different. A panel of venture capitalists early in the day discussed the boom taking place in clean meat investment—notably, even the meat industry giant Tyson Foods began investing in the clean meat start-up Memphis Meats earlier this year. As a result, the conference attracted meat lovers, committed vegans, and everyone in between. The tension was palpable but productive in an afternoon panel combining two clean meat advocates with representatives from Morris Grassfed and the North American Meat Institute. 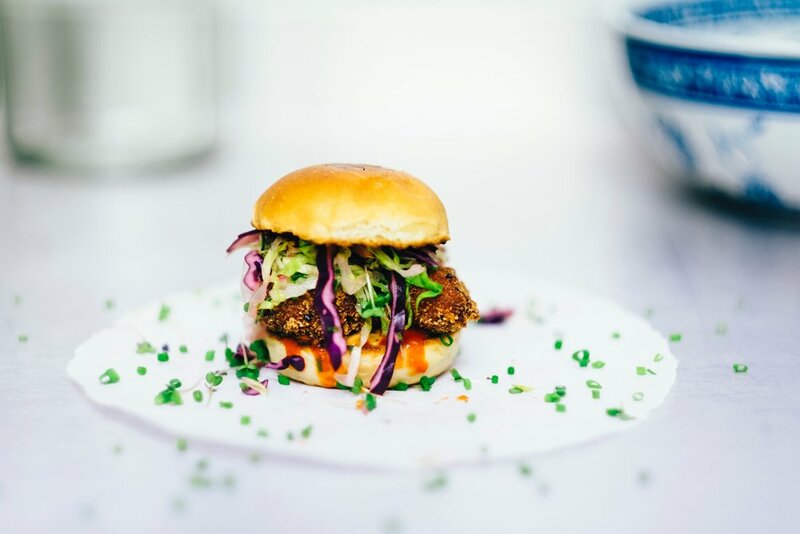 Amid sunny reports on the boost in plant-based sales and the rapid scientific progress in clean meat, the conference also highlighted a new pragmatism in the good food space. While environmentalists and animal welfare activists might hope for a future that fully eliminates meat from our diets, many speakers said that the pace of climate change means we must welcome all solutions that increase sustainability in the short term. A panel at the Cultured Meat Symposium brought together venture capitalists investing in clean meat. Moderator Heather Mack from the Wall Street Journal interviewed Jun Axup from IndieBio, Macy Marriott from Stray Dog Capital, and Laura Zaim from New Crop Capital. Earlier this year, Shapiro cofounded The Better Meat Co. The company’s meat blender is a plant-based protein that can be combined with ground meat so you need less of it. By working alongside meat providers, Shapiro’s meat blenders reduce the amount of meat in a product by 30 percent without requiring consumers to select a fully plant-based option. Organizations such as the Culinary Institute of America, with its Protein Flip campaign, and the Reducetarian Foundation have begun shifting the messaging around plant-based diets to include a wider range of meat-reducing solutions. The Foundation recommends accessible options such as Meatless Monday, Vegan before Six, and Weekday Vegetarian, and stresses inclusiveness. “The reducetarian concept appeals to individuals who may not want to radically change their diet, but is inclusive of vegans and vegetarians, too,” founder Brian Kateman said. A more inclusive approach doesn’t mean activists have abandoned their core values. As former Vice President of HSUS and founder of Compassion Over Killing, Shapiro’s work with meat producers remains fundamentally tied to his concern for the welfare of animals and the planet. At the end of his talk, he pointed out that commercial whaling ended not because it was cruel but because we invented kerosene. “It is difficult to get a man to understand something when his salary depends on his not understanding it,” Shapiro said, quoting the reformer Upton Sinclair. Evidence that a number of powerful forces are coming together to change that reality was no doubt a big reason for last week’s excitement. “We will change our social views of what we deem as ethically acceptable because we will no longer be tied to the economic idea that the way we treat animals today is acceptable.” To achieve the economic foundation for an ethical future, every solution counts. Meat industry tries to block the growth of clean meat — but can it?